Seven months after its historic encounter with Pluto, NASA's New Horizons mission is still dazzling us with discoveries: ancient frozen canyons, chains of icebergs floating in rivers of exotic slush, signs of paleo-oceans, and more. For a quick flyby mission that lasted mere hours, New Horizons is the gift-giver that keeps on giving as its Pluto data trickles back to Earth. Icebergs Floating in Nitrogen Slush? You may have heard of Pluto's 10,000-foot-high mountain ranges of water ice, possible cryovolcanoes, and nitrogen-ice glaciers pouring through canyons and spilling out into wide flat milky plains. What you may not know is that Pluto has floating islands—yes, islands. Or, maybe more correctly, icebergs, of a sort. In the smooth white plains of Sputnik Planum, out among the flat expanses of frosty nitrogen and methane, protrude hills of water ice clustered in chains that almost look like flotsam washed up along the banks of a river. The water-ice islands, or bergs, range in size from a mile to several miles across. At first glance they appear as hills dotting the flat plain, or possibly the tops of taller formations poking above the frigid flows that surround them. But the clustering pattern, along with the directional flow of the slushy glacial sheets, suggest that they are large chunks of material that have broken off nearby highlands of water ice and were carried along with the flow. The clustering in chains may be due to the floating bergs running aground in shallower areas and accumulating—so the impression of riverbank flotsam may be accurate! In fact, it helps to think of the nitrogen glaciers as rivers and the plains they flood into as seas—seas in a much more literal sense than the "mare" (seas) of Earth's Moon, which are flat plains of solid basalt. 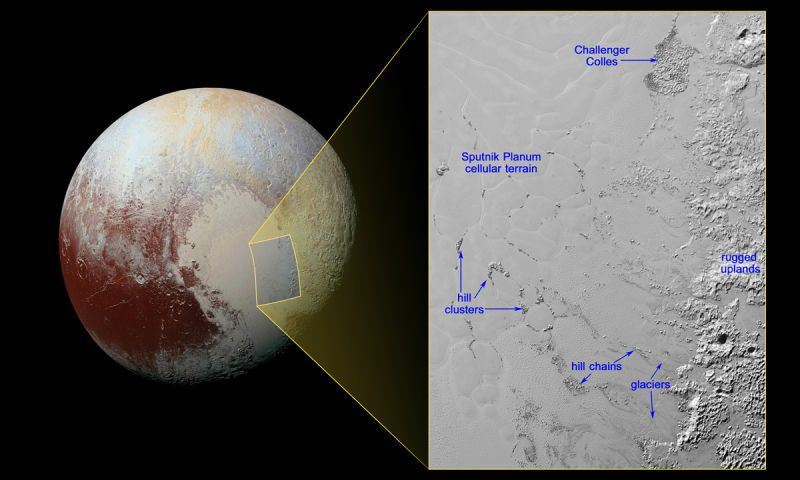 On Pluto, exotic ices of nitrogen, methane, and ammonia (all of which have been detected in Sputnik Planum) are not rock-solid like their water-ice counterpart, but flow somewhat like glaciers do in Earth's warmer climate. Glaciers on Earth are even known to carry chunks of rock and transport them from one place to another—although these usually sink to the bottom of the glacier, rock being denser than water ice. On Pluto, water ice is less dense than the nitrogen glaciers and so would "float" in the slush—not unlike how icebergs float in Earth's oceans. Another news flash came in more recently: "frozen" canyons exist in Pluto's North Pole region—face it, a lot of things are frozen on Pluto. You may think, so what? Isn't every canyon on Pluto technically frozen? What's the fuss about? The canyons in question are a series of long, parallel furrows, the largest of them gaping 45 miles across, bracketing Pluto's geographic North Pole. These canyons, unlike many others found elsewhere on Pluto, appear to be quite old, crumbling and degraded with age, and are possibly made of weaker material. They may be old enough to have formed when Pluto was still tectonically active, when the dwarf planet and its large moon Charon rotated relative to each other and mutually generated a lot of tidal-stress heat. Today, Pluto and Charon are tidally locked, each keeping the same side aimed at the other—like the faces of a figure-skating couple with gazes locked on one another. In the tethered grip the pair have on each other today, there is no longer any significant gravitational flexing or stretching between them to generate heat and drive tectonic activity—the figure skaters are not flexing their muscles to perform spins and throws, but simply clasp hands and no longer generate as much body heat. 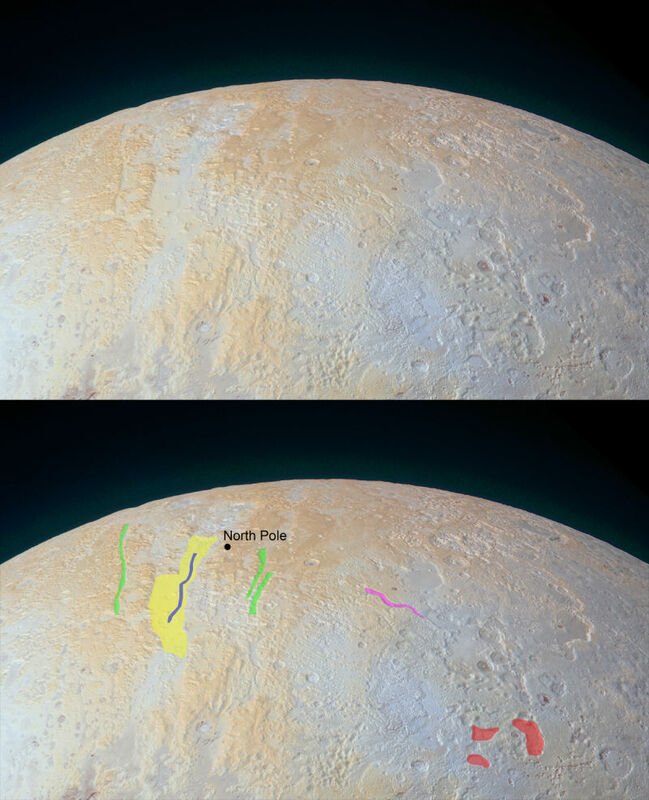 By studying these polar canyons, scientists may gain insight into conditions in Pluto's and Charon's past, when the couple did work up more of a tectonic sweat than today. Finally, turning our attention to Charon (Pluto's big moon) there appears to be evidence of what may have been an ancient ocean long ago. The evidence comes in the form of a series of long, deep chasms that give the appearance that Charon's water ice surface has cracked. One of these "cracks" is 1,100 miles long and up to 4.5 miles deep! 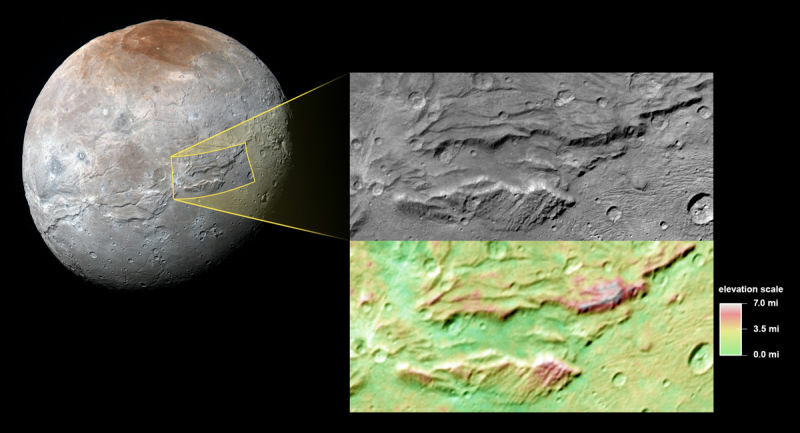 One hypothesis about these epic canyons is that long ago, Charon was warmer, with heat from radioactive decay as well as its initial formation melting at least some of the water ice to form subsurface oceans. As Charon cooled over time, the oceans would have frozen and expanded, pushing the crust outward and forming giant stress fractures—ostensibly the chasms New Horizons captured images of when it flew by last July. We can enjoy the fruits of New Horizons' expedition for months to come. Due to the spacecraft's great distance (presently over 3.2 billion miles from Earth), a limited amount of electrical power, and the fact that it collected many gigabytes of data, it will take upwards of 16 months to transmit it all back to Earth—so the rewards should keep rolling in through the end of this year. 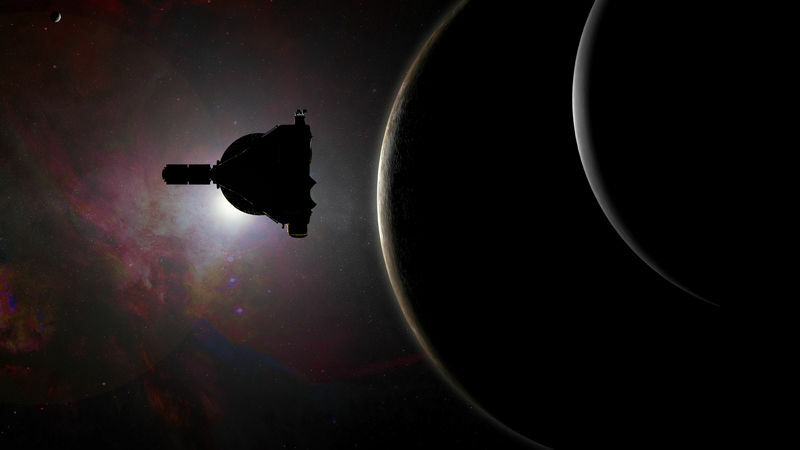 And, there's a fresh adventure on the horizon, as the tiny nuclear robot coasts toward a 2019 encounter with the Kuiper Belt Object 2014 MU69. If the encounter goes as planned, it will be our first up-close look at a small, icy object in the Kuiper Belt, those vast rings of material that encircle the sun beyond the orbit of Neptune.